Preparations have begun for the NMG Awards 2016 which will be our fourth year! With 10 weeks to go, the date passed on 31st July for artists to be eligible for nomination this year. 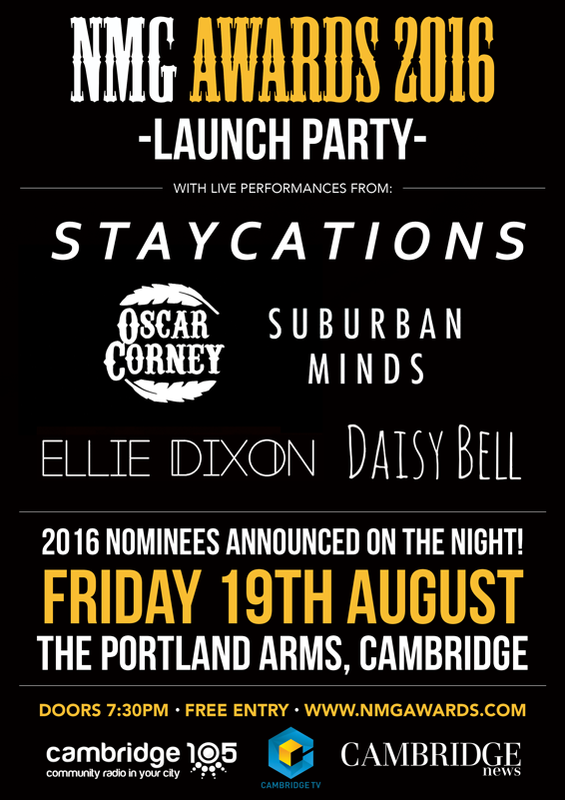 We have more nominated artists in 2016 this year than ever before and we’ll be revealing all the names at our FREE LAUNCH PARTY at the Portland Arms on Friday, 19th August. 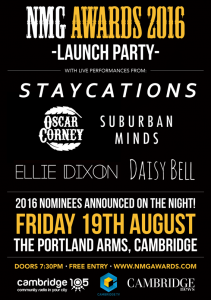 Also performing on the night will be Oscar Corney, Suburban Minds, STAYCATIONS, Ellie Dixon and Daisy Bell. Ticket information for the main ceremony will be announced soon and the full nominations list will be published on this website on 20th August. We are looking forward to welcoming you to the NMG Awards at the West Road Concert Hall on Friday. There is NO parking directly at the venue but there will be street parking available on West Road and surrounding streets. This will be free and we will have stewards helping you to the nearest available space. Please park thoughtfully and leave space for as many people to park as possible. There is cycle parking at the venue but the venue is a rather long walk from Cambridge train station. There will be an interval lasting at least 15 minutes approximately half way through. The show will finish at approximately 10:45pm. As we have to be out of the building ourselves at midnight we ask everybody to leave at the end of the show as quickly as possible to enable us to tidy up. There is a pay bar available before the show and during the interval. It will close after the second half begins. You may take drinks in the auditorium in plastics but the bar will not be serving whilst the show is in progress, you are discouraged from leaving the auditorium during the show unless absolutely necessary. If you have an artist drink token you will be given this, along with your ticket on entry. This should be treated as a £5 note so if you do not use the full value you will be given change back in cash. The voucher can only be used once and must be given up on use. Only artists who bought before the deadline are eligible for a drink token. On arrival, nominated artists will be directed down the red carpet where media from television, radio and print will be gathered to interview selected acts. Guests and sponsors will be directed a separate way. Everybody is welcome to have their photo taken in front of our photo board where a professional photographer will be present in advance of the show and during the interval. All photos will go up on social media following the event so by having your photo taken you are agreeing to this. Once you are ready to enter the auditorium you must visit the box office to pick up your tickets. Again, nominated artists and guests will be split in to two queues. Stewards will be in touch to guide you to your seats. Give your SURNAME to the assistant. Bands do not have to arrive together, tickets are allocated per person and not per band. Please queue in the appropriate line. Have your name but more importantly your BOOKING REFERENCE available. In most cases, tickets will be listed under the name of the person who booked them online. This can mean suits, tuxedos and dresses but can be open to interpretation. Absolutely no t-shirts, jeans, shorts or trainers will be permitted. We reserve the right to turn away anyone who is not dressed, in our opinion, accordingly and in this instance no refunds will be given. Personal photography in the auditorium is discouraged and will not be necessary as we will have local television and professional photographers documenting everything happening on the stage. There are a small number of tickets available for the east balcony, some of these seats are restricted view. These can be bought online until midnight on Thursday. If we have any seats available we will sell these on the door for a higher price and they will be subject to availability. We can no longer seat anymore guests with other friends/family and artists. 14 of our NMG Award categories are decided by our panel of judges, the fifteenth award is decided by you – you’re the judge. All artists included in the nominees list are included in this category so if your favourite artist didn’t make the short list cut, they could still win an award! Simply share this poll with your friends, fans, family, cats, dogs and pick your favourite.